The Broke and the Bookish : Bookish Craft Round Up! Now that spring is (basically here) I know I have caught the crafting fever. Maybe it goes along with Spring Cleaning- but I want to update my wardrobe with cute outfits and spruce up my house with cute projects. I thought that as a crafter and a reader I would make a mini-round up of book related crafts! This one has been on the top of my craft to-do list for awhile now. I have the book and the fabric all picked out all ready. I just have to hit play on my netflix and get going! When you don't know what to do with all the left over pages that you carved out for the clutch above... may I suggest turning them into flowers? I am thinking that this is exactly what I'll do- and then I can feature them next to my shelf of antique books! If flowers aren't your decor ideal- maybe candles are! Here is another way to reuse old pages and other ephemera around your house. Maybe old maps or old letters? I know these are just a few things- but I hope they've inspired some creative thoughts. If you don't want to cut up favorite books- maybe these are some uses for books that you just can't seem to get rid of ("Please used book store just take the ARC I don't want it anymore!") Give the old forgotten book in a corner a new way to bring joy into your life! Happy crafting and happy spring! I love crafting, especially when the items I'm making are book related. I make a lot of my own jewelry; my favorites are the set of earrings shaped like the clouds on the TFiOS cover (mine say "Okay?" and "Okay." I also have a Hunger Games necklace and a charm bracelet with the cover of every Percy Jackson and Heroes of Olympus book. Once I buy more gold chain, I'm going to make a golden snitch anklet. I love the book clutch, although I don't think I could cut a book just to make an accessory out of it. 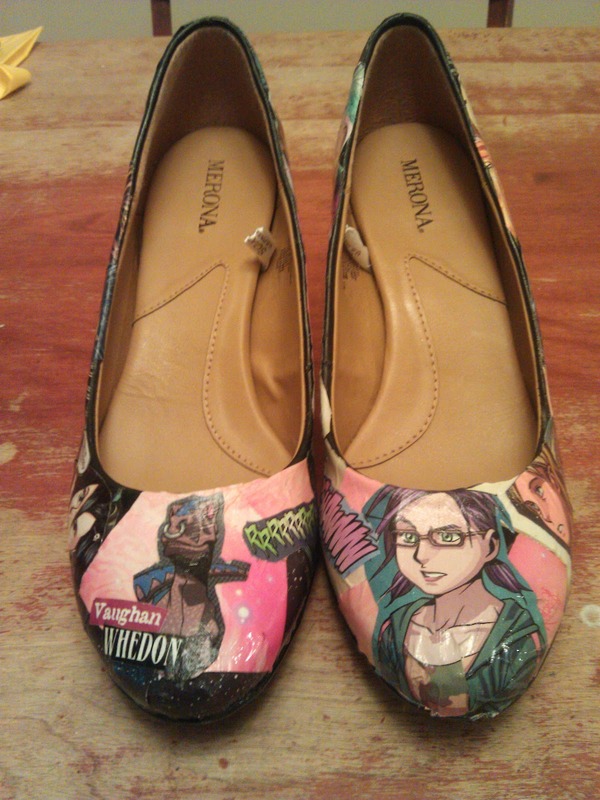 I saw the comic book shoes last night and I was actually planning to do one for myself :) Yours look so amazing and perfect.